A couple of weeks ago, while twittering, I heard about this conference at Boston University called “The Future of Food: Transatlantic Perspectives” which will happen this coming weekend (May 8-9, 2009). Its sort of shocking how close I came to totally missing out on this conference. I have pasted at the bottom of this post, the schedule that they have put together! You can also visit the same schedule at this link. Note that a whole lot of it is free and open to the public! While I am not able to attend all of the great festivities (I live 1.5 hours outside of Boston so this is a field trip for me) I am making it a priority to attend a particular workshop, to be held this Friday (tomorrow) from 2:30 to 5:00. 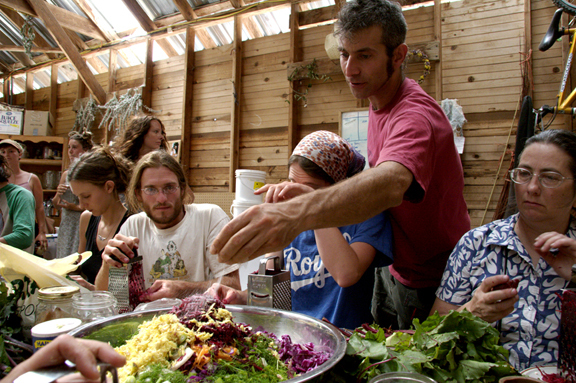 Join Sandor Ellix Katz (aka Sandorkraut), author of Wild Fermentation and The Revolution Will Not Be Microwaved , for this workshop. Learn how easy it is to make sauerkraut, pickles and other live-culture ferments in your own kitchen. Highly nutritious and filled with life, fermented foods have a long history and a promising future. Empower yourself to create these delicious and healthful foods! I have been wanting to buy this book and never thought I would actually get a chance to SEE Sandor speak in person so I am quite excited about this workshop. Fermentation may seem like an arcane skill to learn but if you garden, like I do (see our garden blog at Humble Garden) it is hugely important to be able to do ferments to put up some of the harvest. While fermenting is not hard (the bacteria do all the hard work) its best if you get a good foundation up front so that you do not waste food due to ignorance of important practices and also because you do not know what a good and a bad ferment looks like! One last word on fermentation – its not just about preserving food. Fermentation is the process of changing or morphing foods from a fresh state to some new and improved collective organism made up of a whole, complex and dynamic bacterial ecology where lactobacillus bacteria produce lactic acid that inhibits pathogenic (toxic) bacterial species and ALSO unlocks nutrients, co-factors, and vitamins from the original food. Sandor has completely immersed himself in a fermenting world and seems to be wholly dedicated to bringing it to the rest of us! You can learn so much more by visiting his web site at this link. I will be doing this tomorrow and then report back here after that! 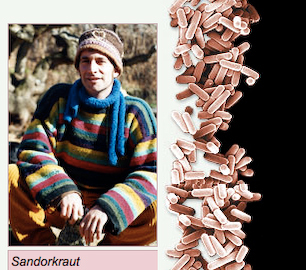 Join Sandor Ellix Katz (aka Sandorkraut), author of Wild Fermentation and The Revolution Will Not Be Microwaved, for this workshop. Learn how easy it is to make sauerkraut, pickles and other live-culture ferments in your own kitchen. Highly nutritious and filled with life, fermented foods have a long history and a promising future. Empower yourself to create these delicious and healthful foods! 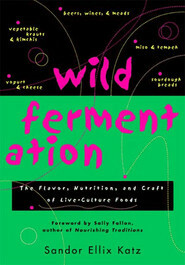 Seating limited | $30 includes signed copy of Wild Fermentation | $20 without book. LAST DAY TO REGISTER FOR “WILD FERMENTATION” IS THURSDAY, APRIL 30! If you have questions about the workshop, please contact Kate Seif at clseif@bu.edu or 610-420-7854. Bryant Terry is a nationally recognized eco chef, author, and food justice activist. He is currently a Food and Society Policy Fellow, a national program of the WK Kellogg Foundation. He is co-author, with Anna LappÃ©, of Grub: Ideas for an Urban Organic Kitchen and author of the recently released Vegan Soul Kitchen. With the help of a Kellogg Foundation Food and Society Policy Fellowship, he has started the Southern Organic Kitchen Project in order to educate primarily African-Americans living in the Southern United States about the connections between diet and health. Dinner (see menu) features recipes from Bryant’s Vegan Soul Kitchen. LAST DAY TO REGISTER FOR “COOKING WITH A CONSCIENCE” IS THURSDAY, APRIL 30! If you have questions about the dinner with Bryant Terry, please contact Kate Seif at clseif@bu.edu or 610-420-7854. In King Corn, Ian Cheney and Curt Ellis, best friends from college on the east coast, move to the heartland to learn where their food comes from. With the help of friendly neighbors, genetically modified seeds, and powerful herbicides, they plant and grow a bumper crop of America’s most-productive, most-subsidized grain on one acre of Iowa soil. But when they try to follow their pile of corn into the food system, what they find raises troubling questions about how we eat – and how we farm. Film-screening will be introduced by Ian Cheney, filmmaker, and followed by discussion with Aaron Woolf, director. This session traces the increasingly obscure path of food from “farm to fork.” The focus is on food production and the industrialization of agriculture. It will consider the growing influence of â€œagribusinessâ€ and the â€œpolitics of food.â€ Our goals are to explore the alignment (or lack thereof) of business and consumer interests and the impact of the transformation of the food system on culture. This session will center on â€œfood security.â€ It will address the rising cost of food and the â€œfuel vs. foodâ€ debate. Is the growing demand for biofuels responsible for food inflation? Other threats to food security will also be explored, namely, fossil fuel dependence, loss of biodiversity, and water shortages. Seating limited | $15.00 | Please indicate when registering whether or not you will attend the lunch. LAST DAY TO REGISTER FOR LUNCH IS THURSDAY, APRIL 30! This panel focuses on â€œfood safetyâ€ with an emphasis on regulation in the United States and Europe, the GMO debate, recent â€œfood scares,â€ and the looming threat of bioterrorism. This panel looks at the relationship between food production and climate change, addressing issues of deforestation, soil degradation, and factory farms and considers whether what we eat can make a difference. Is â€œgoodâ€ food healthy, sustainable, delectable or cheap? This panel explores why our food choices matter. It addresses the â€œethics of eatingâ€ and the health and environmental costs of â€œcheap food.â€ It looks at some of the grassroots alternatives including the rise of organic farming, locavorism, and the â€œslow foodâ€ movement. All Saturday events, with exception of lunch, are free and open to the public. Registration in advance is appreciated and helps us with planning. Note: There will be no admittance while sessions are in process or after 6:00 PM. Please plan your travel to arrive before the start of the session(s) you would like to attend. If you have questions about the conference, please contact Elizabeth Amrien at eamrien@bu.edu or 617-358-2778. It was good to meet you yesterday. You have a great blog and it looks like an amazing & healthy farm! It was great to meet you yesterday too! Those are fantastic quotes, will include them on the write up! Thnx for coming by to visit the blog and lets keep in touch! Coloque um widget medidor do peso ideal, tem tudo a ver com o seu blog.